Spring starts today - that's what the calendar says, anyways. Of course, the gray, windy, weather may beg to differ. This morning, as I was bundling up the kids and muttering something to myself about March being the cruelest month, forget April *grumble, grumble* my three year old son picked up a discarded catalog from the recycling pile. "Mama, mama, look, look, you should buy this!" he said excitedly as he pushed a J. Crew catalog between me and his baby brother. He was pointing at the back cover, where patent leather peep toe shoes mocked me. "Oh sweetie," I said dumping the catalog so I could bend over and lace up my sensible waterproof shearling boots, "I don't need shoes like that. It's too cold." "But the green ones are pretty for you Mama! And it will be nice and warm - soon!" Hang in there Mamas. Spring is on its way. Soon. Now that I'm a mother of two and knee-deep in sibling fights (it seems all I say all day is "stop hitting your brother!") it's very easy to forget those scary days when I was a brand-new mom, home alone with my wonderful but mysterious little baby. Ah, those were the days - the looong days filled with fear and self-doubt. However, I survived and so will you. There's a little secret I want to share with you: You need to get out of the house. Which is of course easy to say...but where should you go? In my case I went to Isis Maternity, and it worked wonderfully for me. It was all new mamas, all the time. I took developmental classes and I met other moms who were in the exact same boat (and who I continue to see every week.) When I was bored, I would stop by and do some quick shopping (much easier than facing a huge big-box chain - my own personal hell) or just chat with the knowledgeable staff who were always ready to help - even helping me with some quick nursing tips while I was getting the hang of it. It's been a while since I've outgrown a place like Isis, but I don't regret the time I spent there or the friendships I've made. Check it out if you have one nearby. Because every Mama needs a posse. I cut my son's hair, and now he looks ridiculous. I don't know what I was thinking. Wait, scratch that. I know exactly what I was thinking. I thought that I had natural haircutting skills - despite the fact that I've never set foot inside a beauty school - because I once cut his hair and it came out quite cute. He looked really hip (if I do say so myself) with his shaggy asymmetrical cut -it looked like he had just been sipping lattes at Starbucks while listening to hip Ipod. Which is quite a feat if you consider that he is only 2 years old. Clearly, that was just beginner's luck, because after last night's cut my poor adorable son looks a little bit like a ragamuffin and I have no one but myself to blame. Now I'm forced to buy one of those Wahl shave thingamajings and start over from scratch. I won't even take him to one of those kid's cuts place because I'll be forced to admit to the stylist that the reason his hair is so ... odd ... (hold on - is that a bald spot over his left ear?) is that I thought I could do her job better than she could. Why is it that when I was working and would get home from work starving and exhausted at 7 p.m. telemarketers/delivery men/long-lost friends would call at 7:15 p.m.? Then I stopped working and was able to sleep in every morning - but the aforementioned started calling at 8:01 a.m.? And then I had a baby...and his precious long nap was from 9 a.m. to 11:00 a.m, so of course my dentist always had to call to confirm my cleaning appointments at 9:26 a.m.? Now I have two kids, and on the amazing days that I get them BOTH to nap (a day like today, when they both went down at exactly 2:30 p.m.) why must a telemarketer, my best friend, and my town's registrar all call between 2:32 and 2:56 p.m.? Why, I ask you? Maybe I was evil in a previous life, I don't know. *UPDATE: It's 3:36 p.m. - guess who just RANG THE DOORBELL? UPS! If my doorbell rings one more time it'd better be Publisher's Clearinghouse and they'd better bring me a $10MM check I SWEAR! It's snowing like crazy as I sit down to write this - the kind of snowfall that would give me anxiety attacks back when I had a commute and I was brand-new to New England. Five years and two all-wheel drive vehicles later I sit in my cozy house and enjoy watching as the landscape quickly changes from gray and dreary to just plain magical. What can I say, I've become one of you. When I'm not staring out the window, I'm packing for our Christmas trip to see my parents. As much as I look forward to the trip (because what is Christmas without family?) 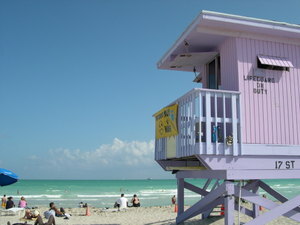 and the amazing weather in Miami at this time of year, I'm starting to feel a bit apprehensive about leaving. The old "White Christmas" fantasy is part of it - for a girl who grew up in the Dominican Republic hoping for a tiny little snowflake on Christmas eve, it is a little odd that now that I have children of my own I'm taking them away from a postcard-perfect Christmas and take them where palm trees glow with miniature lights in the balmy tropical nights. So yeah, that's part of it, but I'm also itching to start our own Christmas traditions. I'm pulled between the comfort of "home" and the desire to create memories of our own for our children. Both my boys are under the age of three. I think the holidays will be more important for them when they're older, so that gives me some time to buy our nativity set and to stock up on gold and burgundy ornaments. 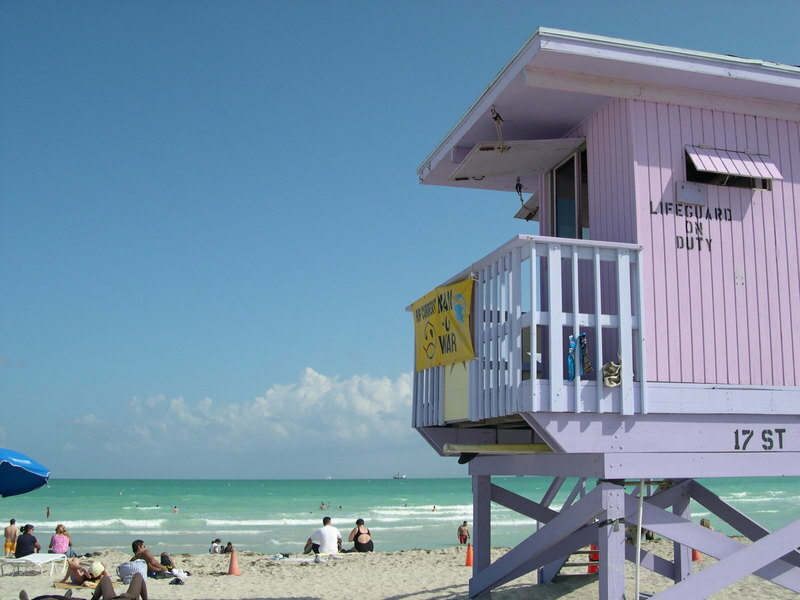 This year, we'll go to Miami and maybe spend Christmas day building sandcastles instead of snowmen. Many of us are tired of dealing with dangerous children's products and have decided to take action. We even wrote about the advantages of shopping at responsible local toy stores because the owners tend to care more about you than the nameless employees at your local big box store. I'm happy to share the following information from a toy store in Newton that is offering free lead testing on up to five of your existing toys. Now you can find out if that family heirloom train set is really covered in lead paint or not. Wonder no more! Kudos to Green Planet Kids for providing this service! partnership with a company that uses x-ray fluorescence technology. Friday, November 30th, from 12 noon to 8 pm. toys that you have at home. are put in the mouth. Limit of 5 toys per household, please. I have to admit that I was nervous when I decided not to buy any toys made in China this Christmas. I'm not the type to buy into media-fed hysteria nor am I a big boycott person. But I have been noticing the overall decline in the quality of the goods I buy and the fact that despite the decline in quality standards prices still seem to be going up. Americans don't care about what they buy as long as it's cheap. WRONG! I said. I care! And when did paying $20 for one little toy train become cheap? Maybe the manufacturing costs for goods made in China are low, but I wouldn't know since the savings aren't always passed on to consumers. Whether you're spending $5 at the Dollar Store or $75 at a baby boutique, chances are the toy you're buying is made in the same place. And so I decided to put my money where my mouth is. This Christmas I'm only going to support manufacturers and retailers that care about safety and quality, even if it means buying less. But with 80% of toys made in China, where could I find toys manufactured under strict quality and safety standards? The answer? My nearest toy store! Yes, we in New England are lucky to have many local retailers that actually care about the toys they sell. The owners know where their toys are made and are happy to answer questions about safety. I f you're lucky enough to live near an independent toy store I encourage you to pay them a visit. You may be surprised at the great stuff you'll find. Take a look at Consumers Union (the publisher of my beloved Consumer Reports) NotInMyCart.org for facts on the safety of our imports. And if you live near Boston you may want to join them for a special event they're planning as part of their Safe Shopper program. It was, of course, the day after the Sox had won the World Series. I’m not a baseball fan (actually, I’m not a fan of any sport) but my husband and I couldn’t help but watch the game on the tiny TV in our guest room and cheer on the local team. I may have shed a tear when the game ended and the neighbors on our sleepy Newton street went outside to celebrate, but at the time I thought it was the pregnancy hormones taking over. We went outside too, and I took a blurry picture of the blood-red lunar eclipse. My newfound affection had very little to do with curses being broken. By then we had been living here a little over two years, but we had spent a lot of that time discussing where in the world we would end up living - for real. Vienna? Miami? London? Rio? What city would allow us to live the life we wanted? Turns out we were already there. At first, I thought this town was boring and was frustrated because it wasn’t welcoming. There's no street grid, so it takes years to learn your way around. Driving a Honda Civic in 10 inches of snow is not fun. I was a frustrated woman, indeed. Until I got AWD and navigation, that is. We had many hungry nights when we first moved here. I was used to eating dinner after 9 pm, and I never, ever went to a restaurant before 10 pm. Have you been in Boston after 10:30? Ghost town! Eventually, we adjusted our dining schedule. Now I eat at 6 pm (sometimes 7!) like a real New Englander. But you know, this town has a way of growing on you. We love going for walks on the Charles River Esplanade (always keeping an eye out for thieves). I love cannolli, and therefore the North End. I’ve been on a duck tour, and it was corny and all sorts of awesome. Canoeing to the playground in Auburndale park. The Barking Crab. Fenway Park. Nantucket. Tanglewood. MassMoCa. I love the history and the scenery that has inspired countless artists: Walden Pond, Emily Dickinson, The House of the Seven Gables, Norman Rockwell. I will never love the snow, but it makes me appreciate our gorgeous summers even more. I even love our simple black and beige colonial with its red door. It's just a rectangular box with a gable roof, the kind of house a child would draw. It screams New England. It's home.